Making the little quilt of spool blocks is something I want to get done quickly. Yesterday I sat down and pieced one. By machine. I’m still astounded. Not once did I have to rip out a line of stitching. Everything lined up like a dream. Thanks, of course, to the perfect stitching lines and matching points printed on the back of my fabrics using Inklingo. I was so happy with how it turned out, I stitched a second. And a third! I was on a roll! Three blocks done in less time than it would have taken me to hand piece one. I was able to press them the way I press my hand-pieced blocks, which made me super happy. Lessons learned? 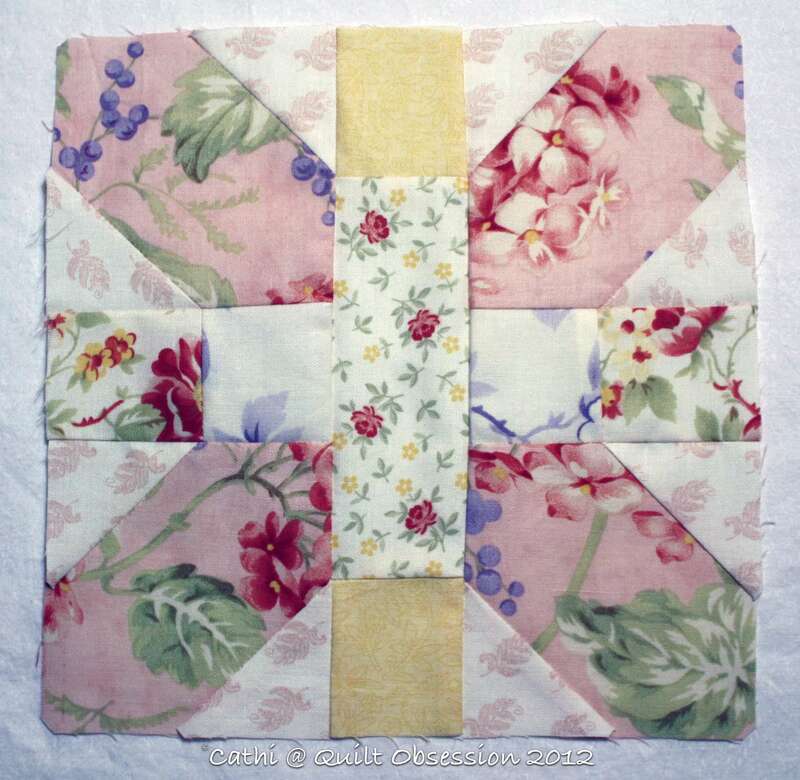 That one has to approach machine piecing a block like this differently than when hand piecing. I look for set-in seams when I’m hand piecing. When machine piecing these blocks, I knew I had to try to avoid those set-in seams. Laying the block out on the cut ‘n press was my biggest aid when figuring out the stitching sequence. What I can’t get over is the amount of pressing when machine piecing. When I hand piece, I leave pressing until the block is finished in most cases. When I was piecing the spool blocks by machine, I was back and forth to the iron constantly. The other thing is the pinning. I probably went overboard and pinned it way more than a more experienced machine piecer would, but my little finger pincushion looked like a porcupine with all the pins I was using. The biggest benefit to me is that I can get this little quilt done quickly and save my hand piecing time for blocks like the sunflowers. We have errands and appointments today but tomorrow I’ll be back at the machine, hoping to get the last 7 blocks done. If I’m home early enough this afternoon I might just get one or two more done today. And now I have a lot more confidence. Who knows what I might try next on the machine when the spool quilt is done? 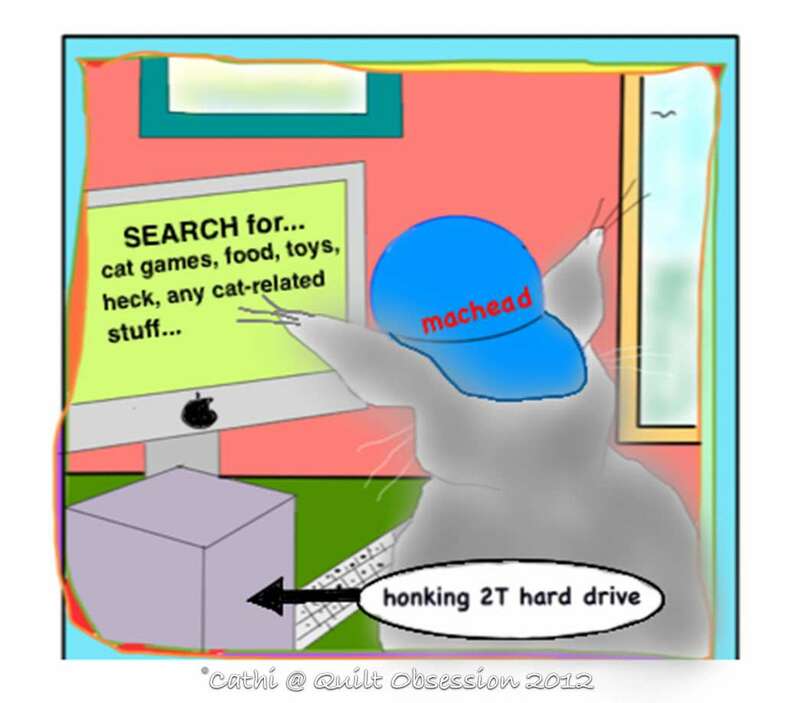 One of today’s errands is a trip to the computer store to pick up an external hard drive. Clearly, we won’t be the only ones using the computer. Baxter has seemingly decided the cat tree is the place to be. 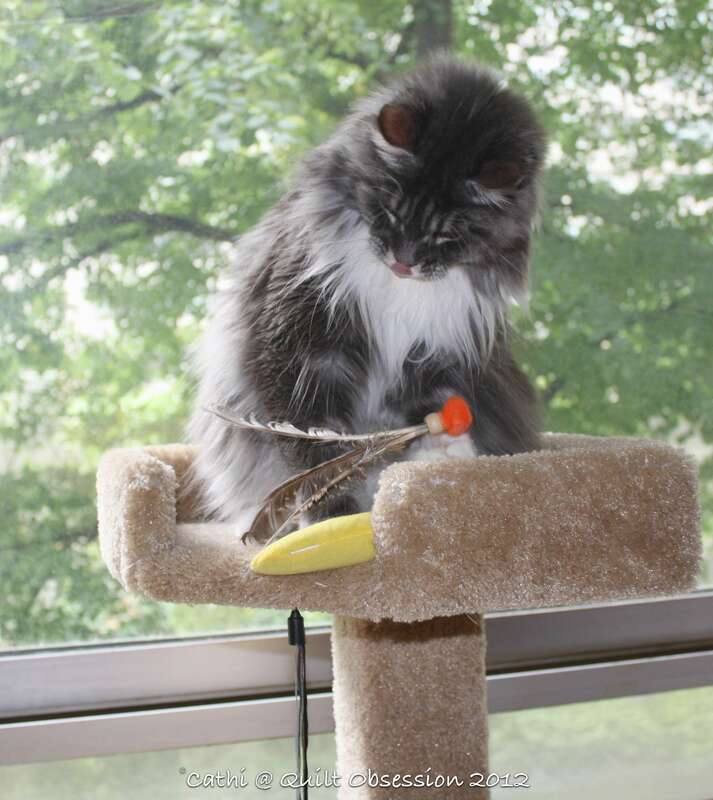 Of course, as he has us wrapped around his not-so-little paws, we immediately made sure he had a toy or two up there with him. 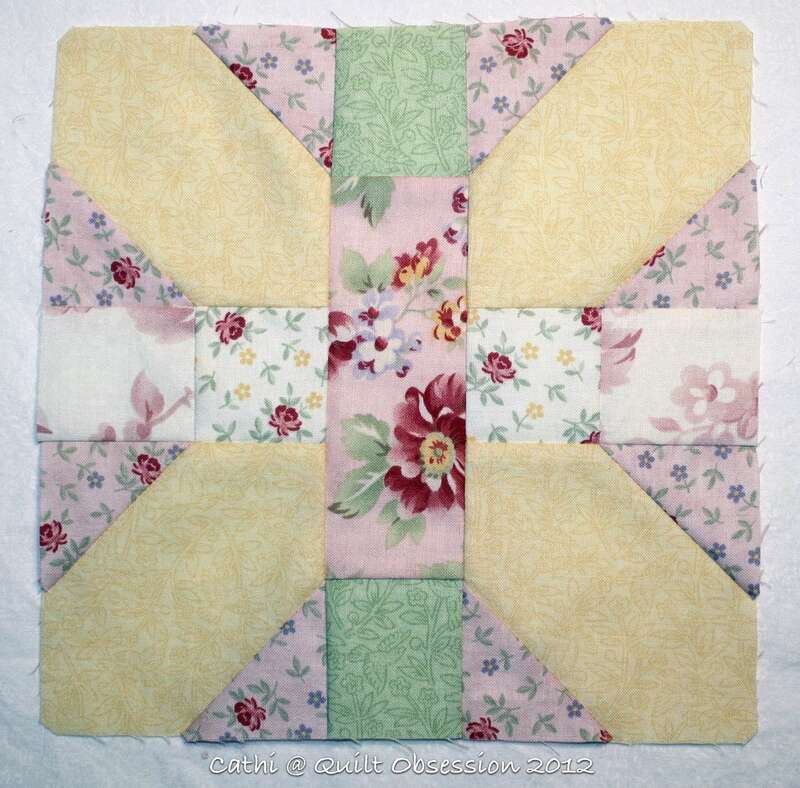 I have loved this design since seeing a Japanese X’s quilt done over at Cabbage Quilts (blog) last year. I jumped all over the Inklingo package. Your fabric choices are beautiful! I look forward to playing with these myself. Baxter’s little tongue peeking out cracks me up! I love your spool blocks! I always pin quite a lot when machine piecing as I’d rather spend 30 seconds pinning than two minutes unpicking!!! Baxter’s tree looks like a great place to be! Sorry about the fingers and the back and forth to the Iron! That is why I chain piece as much as I can, and layout a few blocks at a time, or just sew the same pieces and build the blocks as I go. I also found, laying out pieces on an old small cutting board, and putting in the pins against the firmness of the cutting board saved my fingers! Hope these tips help! The blocks will be wonderful together! Is that a little pink tongue poking out? How funny! 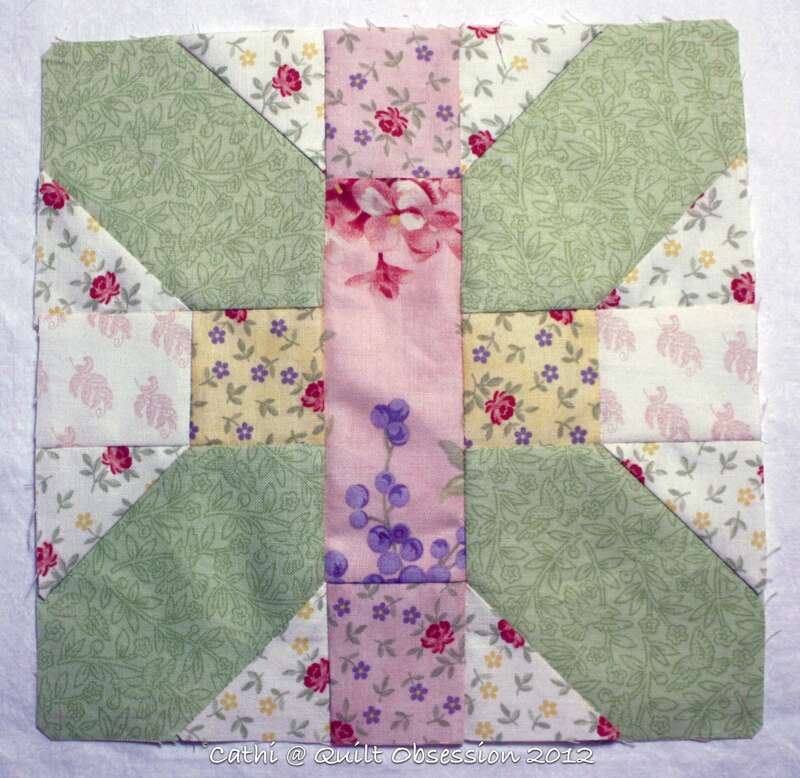 I can see how these blocks would go together well with machine piecing. Love your blocks, glad the machine isn’t fighting you this time! Baxter has his own special place now! And I sure didn’t realize he was computer savvy! Monkey is a hand piecing snob, and even he would machine piece this one! When you have done a few more, I think you will find that you only need one or two pins and no porcupine. LOL. My machine has a walking foot, so I only used two pins on the whole block (on the long seam to line up the squares with the rectangle). How did I ever live without a walking foot? Gorgeous fabric choices, as usual! What beautiful colours! And Baxter, well there is a beautiful cat. Good combination. 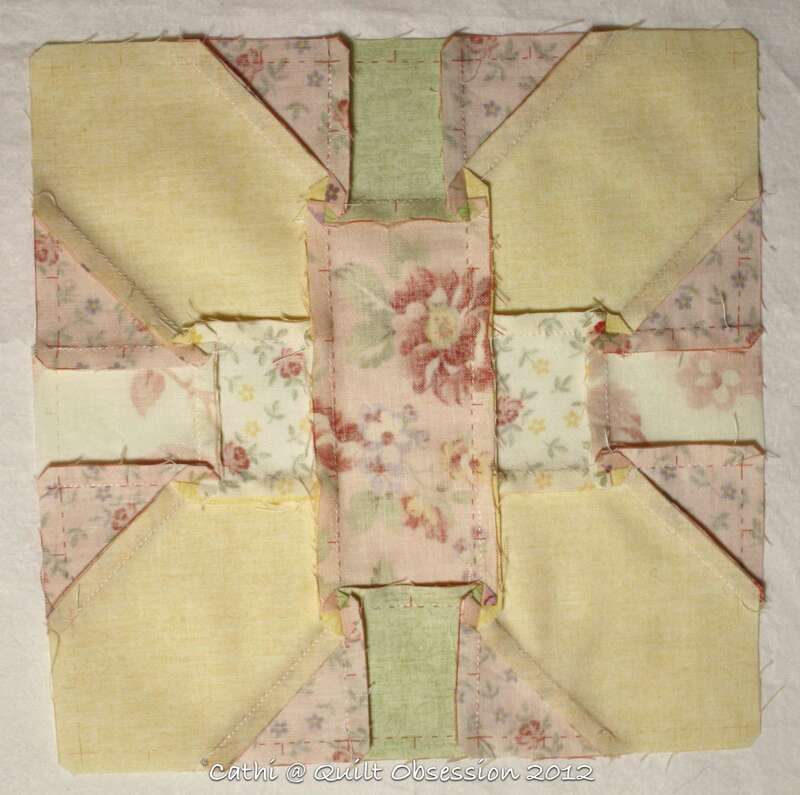 machine piecing!…wow what a change for you…glad to know that it works both ways…and the blocks look great!! these are so cute! cannot wait to get to print mine out. love your color sense.